Gandhinagar: The Prime Minister, Shri Narendra Modi, today dedicated IIT Gandhinagar campus to the nation. He also felicitated Trainees under the Pradhan Mantri Gramin Digital Saksharta Abhiyan. The Prime Minister addressed a public meeting in Gandhinagar, which included a large number of IIT-ians. “You are IIT-ians, I was a Tea-ian when I was young (I sold tea). On this day, a few years ago, I took oath as Chief Minister for the first time. Till then, I had never even been an MLA. I had decided that whatever I will do, I will do to the best of my abilities,” the Prime Minister said. 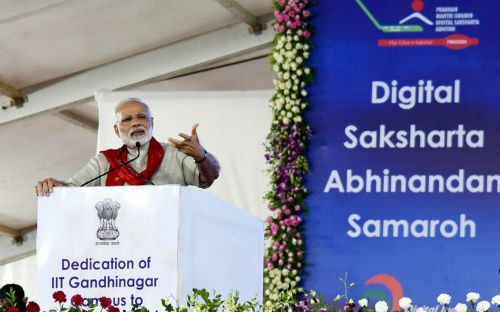 Shri Narendra Modi said that work is underway to spread digital literacy to every part of India, among all age groups and sections of society. In this day and age, we cannot afford to have a digital divide, he asserted, adding that a Digital India guarantees transparency, effective service delivery and good governance. 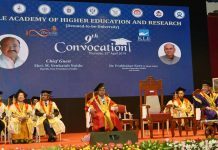 Our academics should not be exam driven; the focus should be innovation, the Prime Minister said.